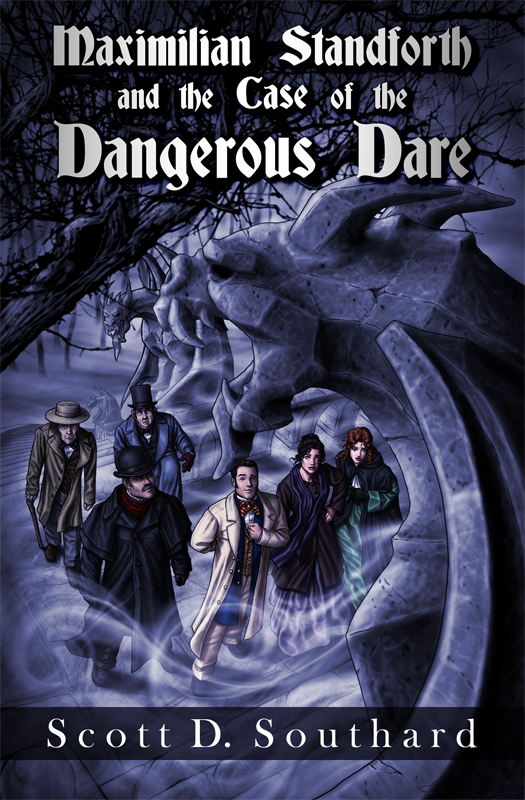 I’m proud to announce that my new novel MAXIMILIAN STANDFORTH AND THE CASE OF THE DANGEROUS DARE is now available! You can get the eBook from amazon.com for just $3.99 (http://amzn.com/B00CXSDEBE) or as a a paperback for the low price of$10.71 (http://amzn.com/1484034287). The book is also available via amazon in other countries. This excerpt is from Chapter 7 (and depicts much of what you see in the great cover art), when our heroes and two questionable individuals arrive at the dreaded McGregor Castle. Enjoy! Even in that cloudless and starless night, it seemed to win out against the sky’s eternity, surpassing it in black, the darkest and heaviest black. All the stories Blackberry tried to tell us on the train, all the fear that McGregor showed at our departure could not match, could only hint at, the vision of horror in front of us. It looked like the kind of place you would believe was built in the center of hell, not to keep evil out, but to keep the evil in. No words exist to express the horror of its peaks, the gothic nature of its shape and structure, the grimness of its design. I wish I could properly convey the feeling of terror it generated in all of us, dear reader. I wish I knew words that would fill you with the same dread we felt, the same repulsion, the same desire to escape, to run. The castle seemed to stretch on for miles. Peaks upon peaks, towers extended from towers, each one greater than the one before. Until finally reaching such a summit I had to assume was the top, for it must be beyond man to go higher, the greatest and darkest tower, that looked to be shaped like a hook or a tip one would see on the end of a devil’s tail. But was it the true extent of that great place? When I dared to look closer at that vast dark castle I could not see where it ended. No, it went on and on, traveling with my eye as if madly being built to keep up with my stare. No, truly, I could only see clearly where it began. The front had an empty moat and an old wooden bridge that seemed questionable to our weight as we crossed over it, the wood creaking and screeching under our cart. The front doors of the castle were large, heavy and wooden and left us wondering whom they were built to welcome. The stairs leading up to them were steep and jagged and gave the impression they were not sculpted out of rock from our earth, but broken and stolen out of it. Many gargoyles could be seen around the front of the structure. The largest of them hanging over the great doors. Its long tongue hung down the side of its mouth, its eyes searching to the heavens while in its chest hung a great sword, almost as if the sword stabbed the beast into place. While most of our little group (Anna, Maggie, Mathers and Blackberry) all seemed to shiver and take in the sight in their own way, Maximilian looked at it with a strange gaze of curiosity. This was new to him and he was fascinated. “Who builds such a place, Bob? Who designs it? Who spends the capital on it? Curious, most curious,” he whispered to me. I did not respond, I had no response to give. I looked away from the estate and my eyes caught the face of Anna. The poor lass looked to be fighting back tears, like a soul seeing their own tombstone. Maggie, my sweet Maggie, looked upon it with emotionlessness. It was as if she was daring it to scare her. She had the face of someone who claimed to have seen worse. The strength and bravery that once caught my eye in our first case together, returning in her strong stare. I wish I could say I looked as strong as I would have liked, but for me, I could not look at it for very long. And yet even in that very first short look, I knew that I would never forget the evil sight. It had found a place, almost immediately, in my nightmares. To this day, in my darkest dreams, I retrace my steps that lead up to those great and heavy doors. It is where cold chills in the wind begin and nightmares first take breath. We stopped in front of the stairs. When the horse came to a halt, the silence seemed to creep in around us. I took Maximilian’s bags and jumped from the cart, helping the ladies after me. As we departed off the back, Blackberry wrapped his long right arm around the old man and whispered in his ear. I could not hear, but Mr. Kite was shaking his head no. Some funds were finally exchanged between Mr. Kite and us, and he reluctantly agreed to make the trip from his cottage to the castle every few hours or so to take one of us away if we were ready to depart. “Yes, yes,” Mr. Kite said quickly in a breathless manner. “I understand. I am not a fool. I understand. Please may I depart?” He led the cart away quickly from us, leaving our little group standing quietly at the steps in front of us. We had no choice now. Maximilian was the first to dare to climb those stairs. We hesitantly followed. They were steep stairs and with each step the front door seemed to grow in gothic proportions. Upon arriving at the door we all stopped and breathed in our undertaking. Yes, in the light of day it seems folly to fear at the approach of an empty castle; but, dear readers, you do not understand, nor could you, the foreboding terror that was in the air at such an undertaking during the witching hour of night. Even Maximilian seemed to feel some of the dread in his soul. Yet, it was with a strength I could not help but be impressed by, he gripped the large doorknob in his hands… and we were inside! Our footsteps echoed off the rough and jagged rock walls. We all stopped upon entering in the center of the blackness, not seeing more than our fingers in front of our eyes, huddled together as if for warmth on a winter day. Blackberry was ordering the terrified Mathers to build a fire outside and bring it in when fire seemed to leap up the walls as if called! The torches around us were now lit. I dropped the bags. No, readers, no, I have no idea where the fire came from, but the torches along the walls were now alit, all of them. It was as if the castle had welcomed us inside. An impossible thought, a ridiculous thought and one I couldn’t help but think all the same. The castle was welcoming us. While most of us looked around horror-struck at the now visible entry hall in front of us, Anna was the only one who screamed. She quickly covered her mouth from emitting more and scurried back up against the door. It was a giant circular room. The walls were a deep rock gray. Besides the torches, there was little else that decorated the walls. A closed door was in front of us, which probably led to the other rooms of the first floor. To the right and left of the front door, staircases ran up the curve of the wall to another series of giant doors on the second level. “Blimey,” Mathers muttered. They were the first words I had heard him speak since he joined our party. I looked at him surprised. His voice was higher than I expected it to be, almost feminine. What an odd man. Blackberry only seemed to rub his hands together. Yes, this probably changed things for him in regards to his series of wages he was running. I didn’t think it was possible for him to feel happier with the adventure in front of us, but now he was practically bubbling with glee. No one moved. If he meant them, he was the only person even the slightest interested in that notion. Anna had still not moved or spoken since her squeal of terror a few moments earlier. I looked back at her and waved for her to join us, giving as best as I could a warm smile, my way of saying she is not alone. Maybe the memory of my promise would give her the strength to take some steps forward? I reached out my hand for her to take it. Maggie… She was watching me. She looked curious. I lowered my hand and once again picked up Maximilian’s bags. “The sleeping quarters are probably on the second level,” Maximilian said pointing to the stairs and up. He led our group to the stairs that lined the right wall and began the long climb to the second series of doors. There was no railing to hold us and the steps felt slippery, many overcome with moss. As we climbed, I instinctively looked at the ground below. I saw nothing that could explain how those flames raced up those walls to light the torches. This was the first of many mysteries I would not be able to answer in the days ahead. It took some time to get to the second floor doors. We all walked slowly up the stairs out of fear, but none more slowly than Anna. We all had to wait for the young miss, but none complained. There was truly nothing driving us forward besides that strange temptation of fear. The same temptation that drives a child to look under his bed for a monster, even though filled with the anxiety of actually finding the terror there. The wide doors creaked opened by themselves, the noise echoing through the entry room, showing us a dark, hallway in front of us. As before, fire was seemingly created out of thin air, lighting the torches that lined the blood-red walls, which stood in stark contrast to the black carpet. Numerous, identical hallways branched off from the one in front of us. The hallway we faced seemed to have no end, no door could be seen opposite us in the distance. The walls were aligned with giant dusty portraits. Not even the faces in the portraits looked happy to be there. “This looks cheery,” Maximilian said under his breath. As we began our walk (with the door behind us shutting of its own free will), I studied the portraits. They covered many generations and looked to be noble, prosperous. Each had names underneath. However, they were not of one family, but many. How odd, I thought. I didn’t remember stories of other owners outside the McGregor family. “Ah,” was Blackberry’s only response. He was studying the now closed doors behind us. “Ah,” Blackberry said again, turning around slowly. This entry was posted in Books, Fiction and tagged Adventure, Amazon, Books, eBook, excerpt, experimental, Fiction, Free eBook, Horror, Kindle, Literature, Mystery, Novel, reading, Scott D. Southard, Surprises, Thriller by Scott D. Southard. Bookmark the permalink.